I can’t write about S-town without giving away spoilers. So if you want to experience the whole series spoiler-free, this is not the post for you. Last weekend I started listening to Brian Reed’s new podcast S-town from the producers of Serial and This American Life. It has consumed my life a little bit over the past few days. If you’re not familiar, it’s set in rural Alabama and begins as an investigation by New Yorker Brian Reed regarding some claims made by Woodstock, AL resident John B. Mclemore about a covered up murder. But the focus quickly shifts to the life of 49-year-old John B. himself, and he is quite a character. John B. is many things: a master of profanity, volatile genius, highly sought-after clockmaker, paranoid conspiracy theorist, caretaker of an aging mother, town discontent, creator of a 60K maze of hedges in his backyard, and as local legend has it, unbanked millionaire with buried treasure. He’s also heartbreakingly lonely. Over the course of a year he spends hours and hours on the phone with Brian Reed convincing him there’s a story to be found in Woodstock, Alabama which John B. refers to as “Shittown.” As we, the listeners, get to know John, it’s clear that in addition to being incredibly brilliant, he’s struggling with severe mental illness and suicidal thoughts. John B. is crass and offensive, but he’s so compelling and even endearing in his vulnerability. When we hear the recording of Brian Reed, creator of the show and now friend of John, receiving the call about John’s death by suicide, we share in the grief. But this is where the show gets ethically very murky. Reed continues to investigate. He investigates the circumstances of John’s death, his extended family, his friends, and then delves deeply into personal matters of John’s life. Because John cannot give consent for everything to be shared from beyond the grave, this is a serious breach of privacy. As this article claims, S-town is incredible, but it should never have been made. While Reed presents each episode with affection and high regard for John, broadcasting aspects of John’s life (such as his homosexual relationships) that he clearly would have wanted to keep private is unconscionable. It should not have happened. But here it is and the result feels like a southern gothic classic. John B. Mclemore could be a character from a Flannery O’Connor novel. The symbols of clocks, tattoos, mazes, and gold are woven through the story. The final lines are epically beautiful and heartbreaking. If S-town were a novel, it would be a masterpiece. But the problem is that it’s not a novel, and John B. isn’t a character. He’s a real person. Hearing from John’s friends and seeing the aftermath of his death reminded me of what Jimmy Stewart in It’s a Wonderful Life! sees in Bedford Falls (now Pottersville) in the supernatural view granted to him of a world in which he’d never been born. Without him there, John B.’s property with his $60K maze made from hedges is sold by relatives to new owners who have no plans to maintain it. The pack of dogs he rescued over the years has no new caretaker. The young man he was mentoring (in a complicated relationship) is facing jail time. S-town is the absolute opposite of It’s A Wonderful Life!. It is neither heartwarming nor redemptive. It is not charming. Instead of ending in reconciliation and new life, S-town ends in heartache, pain, and death. And yet, I am struck by the same message. Hearing friends talk about John and what he meant to them is incredibly moving. It’s almost as if we’re no longer hearing about John B. Mclemore. We’re hearing about every human being struggling with loneliness and a desperate desire to be loved. Every person who sees his/her life as meaningless. And we see the impact, the weight of every human life. John rarely left his town of Woodstock and yet the shock of his death reaches all over the world. The layers and complications of what makes up a human being are vast. No matter how much information we have about John B. Mclemore, nothing can ever plumb the depths of his soul. Every human life is irreplaceable, unique, and worthwhile. St. Teresa of Calcutta said, “If we have no peace it is because we have forgotten that we belong to each other.” Hearing John B’s story reveals the pain of a life of loneliness, of isolation. While he struggled with debilitating mental illness (likely caused or exacerbated by mercury poisoning), the great tragedy lies in his experience of feeling alone in the world–desperate for connection he believed he could never have. But we belong to John B. and he belongs to us. Not because we deserve to have our curiosity about any aspect of his life sated by a podcast that shouldn’t have been made, but because he’s a human being, made in the image of God. May God have mercy on his soul and may perpetual light shine upon him. Thank you for this analysis, Haley! This is beautifully written. I think you hit it spot-on with the comment about how this would be a masterpiece of a novel, but it’s not. I’m still struggling to wrap my head around it. The first few episodes followed a logical story, but after the investigation into John B.’s will, it went off the rails. It seemed like after that, the story was only carried by overemphasized metaphors and anecdotes included purely for shock value. Even in Shittown, in a hateful, broken tattoo parlor and a hateful, broken person, sacrificial love can shine through and highlight something truly beautiful. I’m really ashamed of myself right now, because I listened to the 7 episodes over the last 3 days and never thought about the fact that John B. didn’t give his permission to delve into and make public all the details about his private life that were a part of more than half of the overall show. It’s so clear to me now in hindsight, why I didn’t really “enjoy” the episodes following the announcement of his death like I did the first few-when I thought it was going to be about Woodstock and a murder mystery. Everything after that felt like wallowing in this poor man’s misery and I thought many times of not listening to the rest of the podcasts. Perhaps that was my inner voice saying ‘this is wrong’. It was heart wrenching to hear about the loving gestures he made for the people that were close to him, and how cynical he was about life and his ability to give/receive love, in all it’s forms. Thank you for some perspective. I listened to the first three episodes, but didn’t go on. I couldn’t get into it and found it a lot darker than I suppose I anticipated. Thank you for this post. I have been praying for John B. Mclemore and I hope many others are as well. That is one benefit that can come from having his private struggles made available to the public. This was a lovely analysis! Thank you. About the controversy: I’m not sure it’s really warranted. I listen to a lot of murder podcasts, and every one features the dissection of the life of a person who could not give their consent. The same goes with the biographies and documentaries about long-dead figures. I myself am writing a historical fiction novel where I have taken details from the life of people I will never consult in this side of the veil. The portrayal of John B is so vivid that I think listeners are inclined to think of him as still alive, though we know of course that he isn’t. But revealing details of his life is no different than publishing the diaries of Mother Theresa… or Anne Frank, for that matter. I agree! And I would add that he did give his consent to be on the record. There are times when the recording cuts out because John asks Brian to turn it off and Brian does not reveal what happens in those conversations. More than that, there are multiple instances of Brian making sure that whoever is speaking is comfortable being recorded. I have a feeling, and it is just a feeling, that part of what makes people concerned about the issue of privacy is that this story is sad and dark. It would be easier if we could keep that quiet and hidden and say it’s not our business. I think S-town is a marvel in showing what it means to try to get to really know someone. It reminds us of how complicated our lives are and how difficult it can be to traverse them. I join my prayers with all the others and hope that John B finds (has found) peace. He was always loved. But my problem is when Brian DOES reveal things in those conversations when John asked him to stop recording. Such as his relationship with a man in Woodstock. Brian guesses that John wanted it to be off the record to protect this other man’s identity, but then goes on to share identifying information about this man! That was my biggest problem with the whole show–that conversation that John specifically asks not to be shared. Maybe there are folks who are concerned because of the darkness. That’s not my issue with it. It felt like a Flannery O’Connor novel–one of my favorite novelists which is why I loved listening to it. But John invited Brian to investigate the town, not interview former lovers (that he notably did NOT include on his “to contact” list). John’s mercury poisoning also complicate the consent issue. I don’t think consent was necessary here, though. This was not a journalistic podcast, it was an audio biography. I read a biography over the summer about Winston Churchill that detailed his father’s growing dementia and death as a result of syphilis. This is something Churchill didn’t know and certainly would have wanted kept private. But nobody balks because a biography is not meant to follow the same parameters as a piece of journalism. ones… there would be very few biographies. I think you’re right that this turned into an audio biography. But John signed up to help Brian Reed do investigative journalism. John was not a public figure like Churchill and I think that is an important distinction. That makes sense. I still think that it didn’t technically violate any journalism or artistic code of conduct. But I can see your point- maybe it’s just a breach of trust. I’m gonna have to mull it over. Either way, great article! I’m not sure that John really did sign up to help Brian Reed do investigative journalism. As I listened, it seemed to me that John was really inviting Brian into his life, to learn about its mysteries and intricacies and pain, so that it could be shared with the world. I think it was in the first episode that Brian says it was as if John was opening a portal between them through the force of his will. I don’t think it’s an accident that this man, longing for connection, invited a reporter into his life, rather than a cop or social worker or therapist. He knew he was the real story, and that the story would be told. The whole series read as a beautiful eulogy – I like to think John would have been gratified by the portrayal. That’s not quite true, though. I agree with Lindsay: John B. invited Reed into his home, his life story, his past, etc. ; they recorded hours of phone conversations and in-person visits that had nothing to do with investigating a murder. Reed would have gotten John B.’s permission to record each time; if John had been concerned about the potential for those stories ending up on the air, he wouldn’t have allowed Reed the access he gave him (and he likely never would have contacted “This American Life” in the first place!). What’s more, in an interview with the Longform podcast, Reed said that John B. told him at one point that Brian might end up with a very different story than the one he initially set out to tell. John B. was, to a certain extent, performing for Reed, helping to shape the story of his own life. As for the information that he did *not* explicitly give to Reed, or that he told Reed off the record, it was offered up freely, on the record, by other people who knew him. Reed didn’t need John B.’s permission to talk to them or share their stories, particularly once John B. was dead. So far, so ethical. I think one could certainly question whether Reed *should* have divulged some of that more sensitive information — for the sake of the people John B. might have wanted to protect, for one, or out of respect for what he didn’t appear to feel comfortable sharing about himself. The argument that “John was an atheist, so he’s not around to care” wasn’t as convincing to me, to be honest. In the end, though, I think the producers did justice to John B.’s story and made a very moving tribute to an imperfect, suffering soul. If it moves us to pray for him, so much the better. I also forgot to add: I think, too, the backlash comes from listeners thinking of S-Town as a price of journalism because of the connection to Serial. But it isn’t: it’s a character study. The “investigation” in the beginning is really only a device to introduce us to the main focus. I could not disagree more with the idea that the productiom violated some ethics code. You are ignoring the show’s own grappling with the ethics of continuing after John’s death, and their conclusions regarding John B’s atheism–and a marvelous series of quotes about his beliefs over time, establishing that his athiesm was as central to him as climate change. My own opinion is that the investigation into the town’s response to his death was a fitting eulogy. Much more so than any delivered at his funeral. I find it most off-putting that you impose your values and religion on art and journalism this way. It would be disingenuous of Haley not to “impose”, or more appropriately “apply”, her personal moral convictions to art and journalism. Art and journalism are not morality and ethic free zones, in fact they suffer when we ignore what’s right for a catchy photograph, sound bites or headline. But isn’t viewing atheism as a reason to justify questionable journalist choices imposing your values on the subject? And just because someone who has died was an atheist, how does that change what we do who are still alive? I feel like there are layers of subjective decisions being made, but you have a problem with someone expressing their own subjective opinion on the topic. I think that the fact that John invited investigation into his hometown does not give us all the right to know everything about his personal life when he can’t give consent. The show shared things that John only offered off the record (for instance, when he asked Brian to stop recording to share with him about one of his sexual relationships. If he wanted that to be shared, he wouldn’t have asked Brian to stop recording.). And personal information such as the pain fetish was not something John opened up about to journalists and offered consent to be broadcasted publicly. Would he have been ok with it? We can only guess. I find that very unethical. It seems exploitive of John. My faith does inform how I view the world and informs my view of exploitation as a bad thing because it is against the dignity of the human person. So yes, I am “imposing” my values on this piece of journalism by saying that by exploiting John for entertainment they erred gravely. Your values seem to inform you that making a judgement call such as the one I just made is a bad thing. And you have imposed that value on my comment box. I am trying to echo what’s in the show that you left out. Including the reasoning that what was off the record during John’s life no longer needed to remain so after his death, because he did not believe in an afterlife or have any reason to maintain a reputation later. All these decisions were careful, but you write about them as though they were made without care. Why? Why should someone’s belief in an afterlife affect ethical consistency and integrity? If you would not divulge a religious persons off the record confessions, why treat the atheist with less respect? Treating them differently compromises the field of journalism. Also if he truly was suffering from mental illness his ability to make fully informed decision and consent to anything should also be taken into consideration. I’m glad you wrote about this. I listened to it last week and was left feeling, ugh, at the end. I was really bothered by it and have been mulling over why. I didn’t want to know the gory details of his personal life that I’m certain he’d not have given permission to be told either. I believe his story could have been told without the telling of his private affairs, (the inflicted pain he craved). I liked him and felt sorrow for him for may reasons, his loneliness, his mental illness left untreated, his brilliance, his care for the unlovely people he encountered. He was a beautiful soul. I too wish they’d not disclosed private issues of his life at the end of the series after he’d passed away. That would have left him some dignity. Why did you head this with a spoiler warning if your whole point is that people shouldn’t listen to the podcast? That wasn’t my whole point, GiannaT. And I’m not convinced people shouldn’t listen. I am convinced that it was murky journalism. I couldn’t WAIT to read your post on this topic!! I saw the instagram post and *knew* that during nap time I needed to finish the last episode of this gripping yet awfully sad podcast just so I could read your post. Very well said Haley. Very well said. I could not agree more with you on any of this. In fact, I was thinking about how gossiping is such a huge sin…It’s almost like Brian gossiped the news about John B to all of US. He shared information with US that I did NOT need to know! I don’t trust Brian Reed. I honestly started listening to this podcast thinking it would be a crime mystery. Instead, it’s about someone’s hidden secrets and sad mental state that, just as you wrote, did not need to be shared with the public. I really think A Good Man is Hard to Find should be your next book club book. I completely agree John B. is straight from a Flannery plot line. I have mixed feelings, and many are echoed here. I’m not comfortable that so many personal details should have been shared after his death… but THAT is the epitome of the south and many small towns. Big city New York is talking about him, and these small characters can get their 15 minutes of fame because it’s the most exciting thing that has happened since collard greens at the homecoming parade. I think on some level John B. was out for the shock value of the attention — his homosexuality, his many tattoos and piercings as a method of coping, his needing to be whipped. He became the girl in the pink shirt with nothing else on. He didn’t necessarily hide his homosexuality, he joked about it. He didn’t hide his tattoo, he flashed it in a moment of drunkenness. He didn’t hide his disdain of those he viewed as inferior. He built relationships by being himself and drove them away by being himself. Most people figure out to apply filters. His genius mind couldn’t figure that out. I think he knew exactly what he was doing by calling in Brian to broadcast S-town. I also think he underestimated Rita and other men he made as a part of his life. I believe his brilliance was his down fall. I think he was desperate for help because in the end he became everything he hated while his good nature and desire for an emotional relationship allowed him to justify the actions as a good deed. As Catholics we learn good intentions do not remove the evil from the act — forgiveness is still possible. The act is still evil, not the person committing the act. I feel terribly sorry for John B. and the same time, I completely relate. I have chosen paths that have made life both more difficult and rewarding, and the daily grind is the most difficult, while the big picture is the reward. I’ve had a difficult time learning when to apply filters and when it’s ok to just be. The grueling nature of raising a young family with lots of mouths and laundry, pays off when all my kids are productive members of society and my husband and I can enjoy the fruits of our labor. I’m currently drowning in my laundry, housekeeping chores, homeschooling lessons, while pregnant with another. I rationally know, this will end, and we’ll have good days, and life isn’t always sunshine. 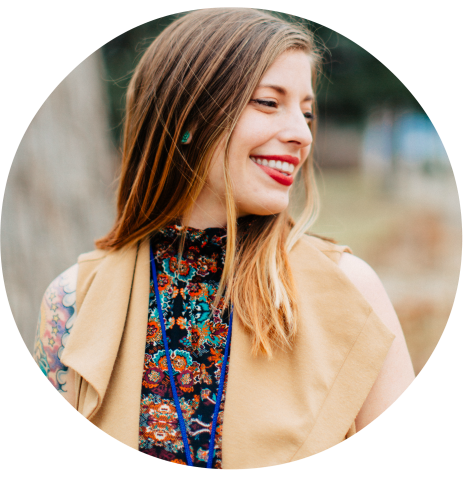 In the end though, should so many details have been broadcast… to me, it felt like a train wreck, in that, should I have continued to listen, when I felt compelled to look and judge. Am I a better person for listening? It definitely compels me to reconsider those around me, take another look at our corporal works of mercy, and ultimately to go seek forgiveness. I wonder if this same outcome could come from listening to a podcast about the life of St. Mother Teresa? Would that have the same impact on our world or me personally? Does the subject change the message? Our world needs more understanding and willing people to step up in the daily grind. 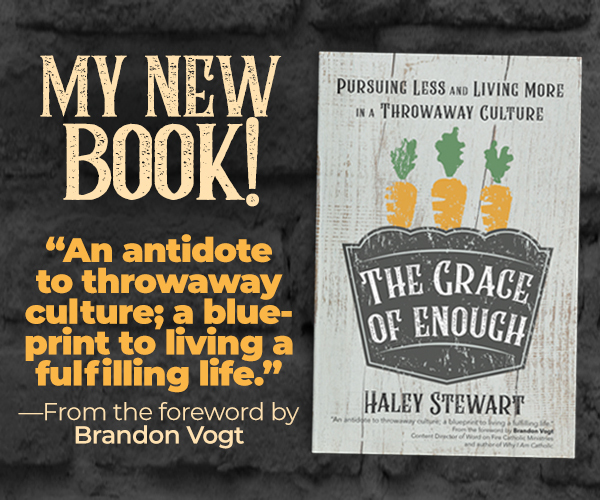 Thank you so much Haley for sharing your thoughts. I just finished listening and I hadn’t given a second thought to the fact that this is a biography of a real person; I was just caught up in the novel. As soon as it ended I was disappointed in the maze not being taken care of, the final whereabouts of the treasure being unknown, and a general lack of closure. But life isn’t always like a novel. I too felt grief when the call about John’s death played. I love the reminder that you share that, atheist, Christian, or what have you, we all belong to each other (thank you St. Teresa!). I was also pulled into S-town and although it was definitely intriguing and entertaining, I had many concerns along the way. First, was my desire for clarity as to what this podcast was all about. It starts out as a murder investigation, then into the brutal shock that John has killed himself, then a treasure hunt for John’s gold, and then just a deeply, deeply personal dive into John’s life. Wrapping up sadness with more sadness. 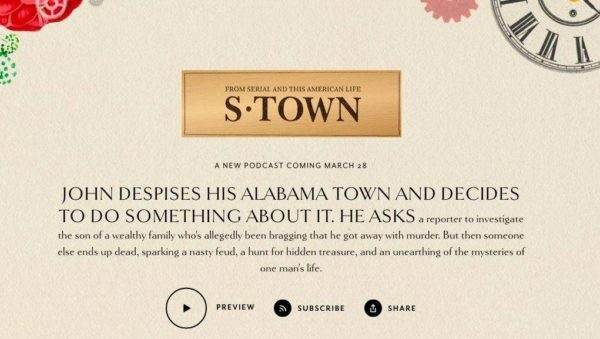 Which I understand life our lives don’t always have neat and tidy conclusions, but the lack of purpose in S-town leaves me to feel that this was purely an expose for shock, thrill and entertainment. My second deep concern, was similar to yours around publicizing such deeply personal aspects of John’s life. And Reed offers a terribly poor rationalization for his decisions to share information John explicitly wanted private. Besides the intrusion on John’s privacy, I also thought often of his mother Mary Grace she would feel about this podcast. My third big issue, was how incredibly speculative so much of Reed’s commentary was. He implies Tyler has possibly located and stolen the gold with how he sets up Tyler’s final interview. Which for all I know Tyler has found the gold, but there’s also a huge chance Reed just needed some shred of a conclusion to his story and another twist for his ending, disregarding whatever trouble it may stir up for Tyler. That’s just one example, the implied relationship & interview with another married man in town also bothered me. As someone from a small town myself, I can only imagine the rumors flying in Bib County. I had many other concerns but thank you for your remainder of John’s humanity and our connection to him in God’s family. You have offered me a bit of ending and purpose to S-town that I was missing. I will remember John in my prayers. Thank you. Great observations, as always, Haley. I was very concerned when they said that since John was dead and he was atheist, they decided to reveal information about his personal life. Does his right to privacy die with him? What about his mom? Does ruining John’s reputation hurt her at all? Lots of questions to mull over. John felt marginalized his whole life because he knew that living in Woodstock would never allow him to fully be who he was; and just maybe he stayed there because he was afraid to find out what that really looked like. I think he was hoping Brian would tell his story. Nothing was told that he hadn’t made known to someone else. If it hadn’t been made, none of us ever would have heard of John and we never would have had the chance to be reminded how we may never really know our neighbors, our friends, our own family. How people who are different don’t need to be ostracized further, that it’s the way of our Lord to give them our time and compassion. John B was an atheist because science never disappointed him. Coming from a small Alabama town myself, I can promise you that he knew he wasn’t welcome in a backwoods baptist church that passes for Christian down there. I think you’re hyper-sensitive to the wrong thing in this story. It has to be told. We need to hear it. And I think John B would have been proud of the end result, mostly hearing that many people cared enough about him to mourn him.